Babblings of a Mommy: Renew Your Winter Skin With StriVectin Giveaway! Renew Your Winter Skin With StriVectin Giveaway! As we head into the latter part of 2015, we might be thinking about what resolutions to make for next year, but why not make a resolution for your skin as well? After all, skin is your best accessory. That’s why I’m so excited to partner with StriVectin to help achieve your skincare goals and attain a healthy ageless complexion. StriVectin was initially started as a stretch mark phenomenon, selling over 6 million tubes of StriVectin-SD globally. Today, StriVectin is a clinically-proven, scientific skin care line that offers comprehensive anti-aging solutions for all. Their formulas contain the patented, proven NIA-114 molecule that powers up skin to repair damage and rejuvenate your appearance. So what better time to start thinking about a fresh new appearance than now! Whether it’s wrinkles, loss of firmness, or loss of radiance, StriVectin has a supercharged formula for your anti-aging concerns. Today I’m giving away a TL Advanced Tightening Neck Cream, and Oxygen Infusion Smoothing Mask! Features breakthrough Gravitite-CF Lifting Complex™ to provide visible lift in the neck and profile area- immediately and over time. Gravitite-CF Lifting Complex™ contains a powerful blend of technologically advanced ingredients that address the appearance of sagging due to gravity and improve skin elasticity. Instantly, skin is hydrated and feels tighter, smoother and more supple. Over time, the visible effects of gravity appear reversed for even more refined and toned definition of the neck line, profile, and décolleté. A purifying mask that lifts dirt and impurities as it delivers radiance boosting oxygen to skin through a unique self-foaming technology. Beta-hydroxy acids, provide gentle exfoliation to remove dead surface cells, minimizing dullness and reducing the appearance of lines and wrinkles for a refreshed, youthful looking complexion. To enter to win simply follow the instructions on rafflecopter widget below. US Residents Only. Good Luck! As a new single mom of a baby and full time teacher my skin could use this! I'd like to win this prize because my skin usually looks so dull in the winter and the mask sounds like it would really help. I am aging and I would love to have soft smooth skin again. Or at least help it look better! I just turned 50 years old and, unfortunately, time and gravity has taken its toll on my skin. 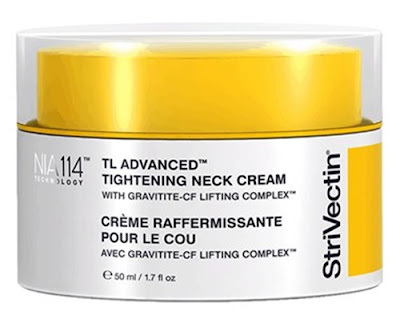 I've heard great things about StriVectin products. This would be a great way to help oxygenate and rejuvenate my skin. I could use a boost in skin radiance and neck tightening!